Manage teams and projects centrally. Already have an Admin Console account? PlanGrid is one of the easiest applications to use, and training staff to use it was just as easy, only taking less than an hour. 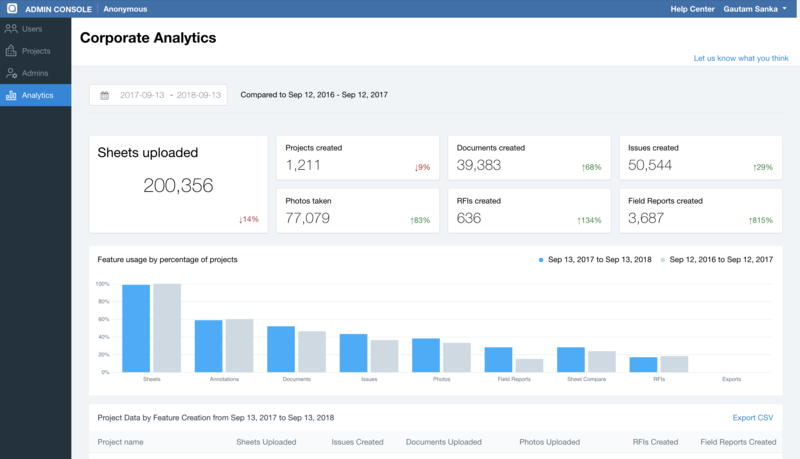 See and adjust settings for all of your organization’s projects (including users, sheet count, and project status) from a single dashboard. Admins can add and remove team members individually or in batches, and control permissions for who can edit or publish documents. Use SSO to manage your team’s access to PlanGrid through your preferred SAML 2.0 identity provider, such as Azure AD, ADFS, Okta, and OneLogin. Corporate Analytics showcases top-level actions taken by users under their organization. View information related to the creation of documents, sheets, issues, RFIs, and field reports, highlighting feature usage at both a project and team member level.